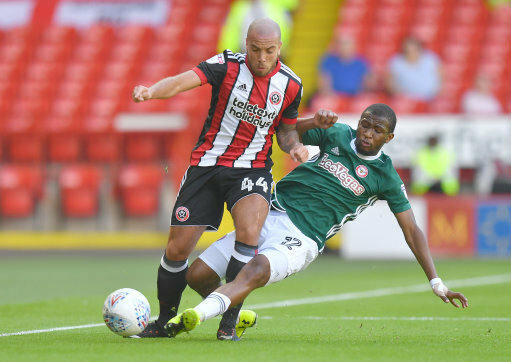 Sheffield United's Samir Carruthers (left) battles with Brentford's Kamohelo Mokotjo. Sheffield United returned to the Championship in winning ways after a single goal was enough to decide this fixture with Brentford. Recent meetings with the Bees haven't gone without controversy and this one was no different. The goal a-side, United struck the post twice and saw two goals disallowed for offside - the second was questionable. Brentford too hit the woodwork when perhaps they should have rustled the net. The United side saw three new starters in the XI making their debut. Keeper Jamal Blackman and defenders Richard Stearman and Enda Stevens all started. Lundstram was amongst the substitutes, with only Evans and Baldock (of the new signings) not present. The early exchanges saw United get off to a blistering start, and within two minutes had forced a dangerous free-kick. Shooting towards the away end in the first half, the defence stood firm and O'Connell did well to cut out Dalsgaard's cross and Jota saw his effort tipped over the bar by Blackman. At the other end, United's best chance thus far saw Stevens do well to loft the ball into the box but Clarke was unable to head on target. Brentford's midfielders were in fine form, in particular was Ryan Woods who created a number of chances, but the hosts were fortunate that the Bees forwards were failing to hit the target. Jota fired wide after beating an offside trap but as half an hour approached the Blades grew stronger and forced their opponents back - on 25 minutes a ball through to Stevens saw the newbie smash a hard low deflected shot against the far post and it bounced back straight into the keepers arms. Basham came close to connecting with a header at the far post, Coutts saw his effort blocked and an appeal for a penalty was waved away. It didn't take too long until the deadlock was broken. A corner from the left hand side was recycled by Clarke, at first he miss-hit the connection (jokingly named by the supporters as the Leon shuffle), but composed himself to chip the ball into the centre and SHARP beat his marker to head at goal and keeper Bentley could only get an hand to it. Play was upheld soon after, after Sharp and Egan clashed heads - both required treatment and added an extra two minutes onto first half stoppage time. Much like the first half, the early stages of the second half began quite frantic. United now shooting towards the Kop faithful were in high spirits and within 40 seconds, Clarke got the better of Henry but Sharp's header was straight at Bentley. Jota tested Blackman from distance, but the on-loan Chelsea keeper was in fine form - and would end up an equal contender for Man of the Match. United remained dominant and saw two goals ruled out for offside! Firstly, after Stearman charged forward and hooking the ball into the path of Clarke, who in turn blasted home from close range - but the striker was deemed offside. Following a foul of Carruthers, United were awarded a free-kick. A well-taken kick saw Fleck's effort spin round the wall and off the foot of the post, Sharp acted quickest to tuck home but again the flag put a damper on any further celebrations. Fleck fired a shot well wide but Brentford, who have finished above tenth in each of the last three seasons, showed their own threat with a triple chance, but squandered their best opportunity of the match to level. The ever menace Jota again tested Blackman from distance, his curling left footed shot was palmed away by the keeper but Yennaris looked destined to head the rebound home but somehow cannoned off the crossbar and when Vibe had the goal at his mercy, he headed wide. O'Connell acted bravely in the box to block Watkins effort after Vibe had played him through and shortly afterwards the Blades made their first change with Lundstram replacing Carruthers. Both teams looked tired as the 70 minute mark broke. Again, Blackman showed outstanding skill to keep out the opposition when a goal looked likely. A fantastic pass from Woods split the United defence in two and as Maupay raced clear, unmarked in the box he swiftly rounded the keeper but somehow Blackman recovered to smother the shot. After linking up with Watkins, Maupay fired his shot wide on 88 minutes as Brentford applied further pressure but United stood firm and held out the further three minutes of injury time to record an opening day victory. Sheffield United: Blackman, Stevens, Fleck, O'Connell, Basham, Clarke, Sharp (Lavery 78), Coutts, Freeman, Stearman, Carruthers (Lundstram 70). Unused: Wright, Duffy, Lafferty, Eastwood, Brooks. Brentford: Bentley, Henry, Bjelland, Jozefzoon (Watkins 59), McEachran (Maupay 78), Mokotjo (Yennaris 59), Egan, Woods, Vibe, Dalsgaard, Jota. Unused: Colin, Sawyers, Daniels, Barbet.